Comfort House Bear Plaque - Custom Bear Shape Sign For Address, Cabin Name, Location Marker, Or Other Custom Message - #CBEAR12085-2L by Comfort House at Community Greenhouse. MPN: CBEAR12085-2L. Hurry! Limited time offer. Offer valid only while supplies last. Bear shape address sign for wall mounting. Holds one or two lines of personalization. The one-line address sign holds up to four (4) 3'' characters. 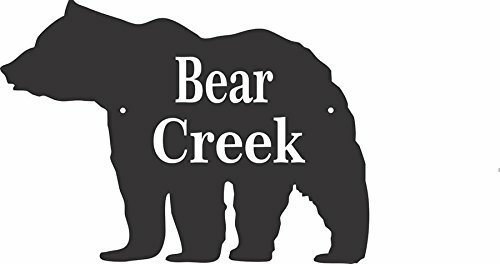 Bear shape address sign for wall mounting. Holds one or two lines of personalization. The one-line address sign holds up to four (4) 3" characters. On the two-line sign, each line holds up to eight (8) 1.25" characters. Number size shown in customization generator is not representative of actual size you will receive; main image provides better idea of finished product. Choose from black, white, blue, brushed gold, brushed stainless, yellow, red, and green. Custom made to order. # CBEAR12085-2L from the Comfort House special shape plaque collection. Bear shape address sign holds up 2 lines of house numbers or letters. Makes the perfect cabin name sign. Made from sturdy UV-stabilized non rusting 1/8" laminated acrylic. Choose from black, white, blue, brushed gold, brushed stainless, yellow, red, and green. Approx. 12"W x 8-1/2"H. Two 3/16" diameter mounting holes. Stainless steel mounting screws included. Made in USA. Comfort House # CBEAR12085-2L. Wildlife theme address sign.